The Republic of Indonesia is the largest archipelago in the world comprising 13,466 large and small tropical islands fringed with white sandy beaches, many still uninhabited and a number even still unnamed. 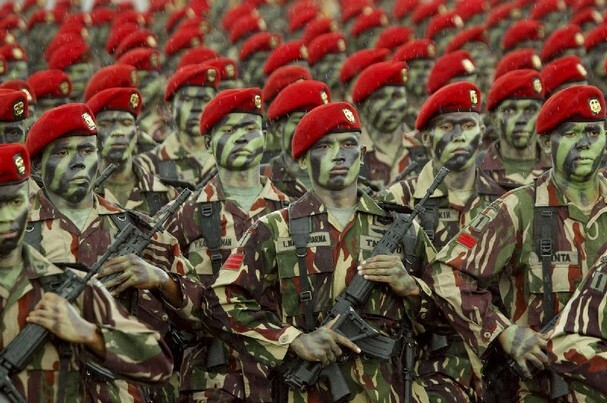 Indonesia has a total population of more than 250 million people from more than 200 ethnic groups. The national language is Bahasa Indonesia. Indonesia has three time zones – Western Indonesia Time which is GMT +7 (covering Sumatra, Java, Madura, West Kalimantan, Central Kalimantan), Central Indonesia Time which is GMT +8 (covering East and South Kalimantan, Sulawesi, Bali, Nusa Tenggara) and the last is Eastern Indonesia Time which is GMT +9 (covering Maluku and Irian Jaya). Jakarta, Yogyakarta, and Surabaya are GMT + 7 or 16 hours ahead of US Pacific Standard Time. soo how powerfull is indonesia? Manpower - Going beyond military equipment totals and perceived fighting strength is the actual manpower that drives a given military force. Wars of attrition traditionally favor those with more manpower to a given effort. Army Strength - Tank value includes Main Battle Tanks (MBTs) and light tanks (a few remain in service) as well as those vehicles considered "tank destroyers". There is no distinction made between all-wheel and track-and-wheel designs. Armored Fighting Vehicle (AFV) value includes Armored Personnel Carriers (APCs) as well as Infantry Fighting Vehicles (IFVs). Navy Strength - Aircraft Carrier value includes both traditional aircraft carriers as well as "helicopter carrier" warships (the latter growing in popularity worldwide). Cruisers are no longer tracked due to their declining value on the world stage. Submarines value includes both diesel-electric and nuclear-powered types. Natural Resources (Petroleum) - As much as any weapon system is vital to an ongoing military campaign, wars still rely on the availability of natural resources, namely petroluem (oil). BBL/DY = Barrels Per Day. Logistics - War is as much a battle of logistics, moving man and machine from-to points all over, as it is direct combat. A quantitative/robust Labor Force also adds to available wartime industry. Finance - War goes beyond simple physical "strength-in-numbers", relying heavily on financing and effort as much as any one piece of hardware fielded. All values presented in USD ($). Geography - Geographical values primarily figure into a defensive-minded war (i.e. invasion) but can also aid a nation when responding to such an act. Keren kujungi bloger gue juga geh muji88.blogspot.com mksih moga berkah.